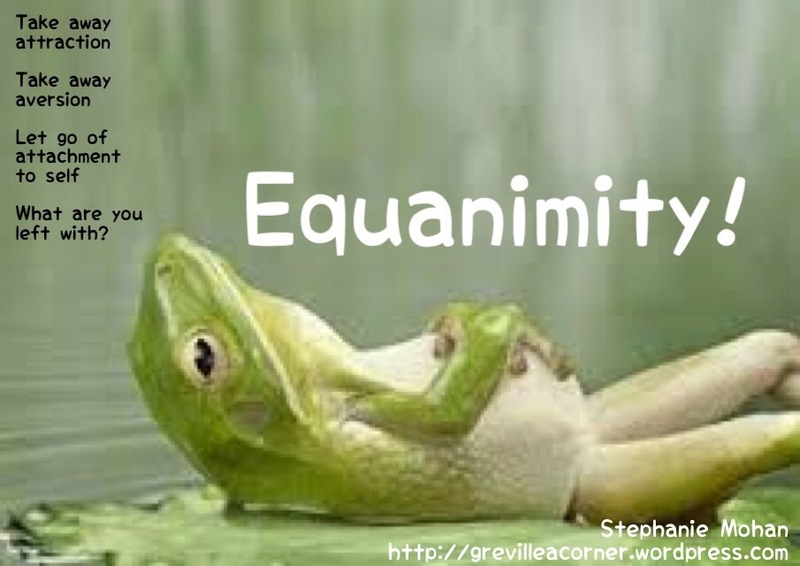 Equanimity is about as opposite from the Ego as you can get. Mental calmness is what most of us crave, but it seems to be the hardest thing to achieve. We hear so much about how we should be find time in our daily lives to mediate. When some of us barely have time to sit down properly and eat a meal. There is a lot of talk about ‘balance’ as well. What is balance anyway, and how do we even begin to find our way to achieving it? Tranquillity, calmness, confidence and peace, what it all comes down to is detachment!! From the moment we wake up we start to stress. Our feet barely hit the ground and already we are all up in our heads. The Ego has been waiting patiently all night for this moment – your wake time! With stress comes moodiness, with moodiness comes agitation, with agitation come upset, the list goes on and on. Before you know it, the day seems to be in ruins and you’ve only been awake for less than an hour or two. Equanimity is about balance. It relates to the stability and self-control of our mind. The Ego likes to think it is in charge, and for the most part of our waking day, it is. But, like anything else, with a bit of hard work and dedication, this way of thinking can be altered and changed for the better. Detaching from your mind thoughts, separating yourself from obsessively thinking is simply learning how to ‘change’ the focus of your mind. Disengaging the Ego and learning how to focus on the present moment is a process that everyone can learn how to do and master. The power of the present moment is the enrichment that keeps us from the brink of insanity to sane. Where ever you are, and whatever it is that you are doing – just be ‘present’. Letting your mind wander off into the future, which is anywhere but ‘now’, is why we let ourselves get so stressed out. We are constantly trying to control what is going to happen ‘later’. The sadness in all of that, is we have no control over anything but what is transpiring in this very moment. Practise detaching from any thoughts that lead you further than now. There are so many benefits to be had if you can follow this exercise. Make it a new habit.